The FDI inflow to Central, East and Southeast Europe reached a new high in 2005, EUR 55 billion, 18% more than in the previous year. But FDI inflow and its growth were unevenly distributed. This publication provides an analysis of recent developments and prospects of FDI in the new EU member states, the Southeast European countries and the European CIS members. It tackles all major issues brought forward by the latest statistics: FDI inflows and outflows, inward and outward stocks, forms of FDI and trends in FDI related earnings, and changes in FDI by home country and by economic activity. The analysis is followed by two sets of tables: Tables I contain total flow and stock data according to the respective countries¿ National Banks while Tables II provide more detailed FDI data by economic activities and by countries. The main source of data are the National Banks of the individual Central, East and Southeast European countries. FDI flows are taken from the balance of payments, stocks from the international investment position statistics. Austrian FDI is covered in the way the receiving countries report it. 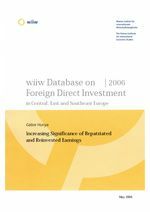 The wiiw Database on FDI contains some 2600 time series and is available in print and PDF as well as on CD ROM. The latter version contains longer time series and provides tables in HTML, CSV and MS Excel format. The publication is scheduled to be issued at the end of May each year, when most data for the previous year have been published.